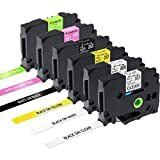 6 Pack combo set 100% Compatible for Brother Label Maker Tape 12mm, 0.47 tape, 12mm (1/2") x 8m (26.2ft).TZe Color Tape: Black on Clear(TZe131), Black on White(TZe231),Black on Yellow(TZe631), White on Black(TZe335), White on Berry Pink(TZe-MQP35), White on Lime Green(TZe-MQG35). Material: ABS. Compatible for Brother P touch label makers:PTD210, PTD400AD, PTH110, PTD600VP, PT1290, Pt-d400, PTD400VP, PT-D200,,PT2730VP, PT-2730, PTD450, PT-1890C, PT-1950, PT1880C, PT-1880w ,PT-2030, Brother P-touch CUBE, PT-P300BT ,PT-D600, PT1230PC, PTP750W, PT-1890w, PT-1890SC, PT-P700, PT-1880, PT1880C, PT-H100, PT1290, PTH300, PTP900W, PT-P900W,PTP750W, PT-1280, PT-P750WVP,PT-P750W ,PT9700PC etc. With 24 month warranty, all products in Greateam are certified by ISO9001 and ISO14001. The good performing rate is more than 98%. Easy to peel, durable, scratch, chemical resistant, resists fading, abrasion and damage from water, heat or cold. Perfect for indoor and outdoor use. Black on Clear;black on White;black on Yellow; White on Black; White on Berry Pink; White on Lime Green.